Two young boys were seriously injured Monday afternoon when a gust of wind blew an inflatable bounce house into the air with three children inside. Two of the children inside, boys ages 5 and 6, were tossed to the asphalt from at least 15 feet above ground. The boys were taken to Albany Medical Center, where they were admitted for serious injuries. According to reports, one suffered a traumatic head injury. A 10-year-old girl was also inside when the bounce house got carried away, but only suffered minor scrapes when she fell. One of the boys landed on a parked car while the other landed on pavement after being tossed out of the bounce house around 3:20 p.m. off Ferry Boulevard. According to South Glens Falls Police, the boys’ conditions were not known as of early Tuesday, but the one boy who landed on the pavement was conscious and talking at the scene. A neighbor told reporters that the younger boy suffered two broken arms and facial injuries, while the older boy suffered a serious head injury. Both were apparently conscious and alert at the hospital later Tuesday. Police claim that the wind blew the bounce house more than 50 feet in the air from in front of a four-apartment complex at 22 Ferry Blvd. to the fields behind Oliver W. Winch Middle School. The bounce house was apparently owned by a resident of the complex, and it had been set up for neighborhood children to play in. The inflatable house was fixed to the ground with stakes, but the wind pulled them out. 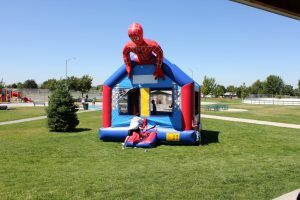 According to the Center for Injury Research and Policy, around 30 children are sent to emergency rooms across the country every day to treat bounce house injuries such as broken bones, sprains, cuts and concussions. That’s nearly 11,000 child injuries per year. Most of these injuries happen when children fall inside the bounce houses by crashing into one another, falling clumsily or by falling outside the bounce house itself. Following a bounce house accident, the primary concern should be obtaining medical attention for the injured parties. Once medical care is rendered, a full investigation should be conducted to determine the exact cause of the accident. This is important, not only to identify any negligent parties that are liable for the accident, but because doing so could prevent other children from suffering the same fate in the future. A New York Personal Injury Attorney at Whittel & Melton knows just how dangerous bounce houses and other inflatable toys can be. If someone you love has been injured in a bounce house accident, please call us today statewide and toll-free at 866-608-5529 to discuss your case without any cost or obligation on your part, or contact us online.